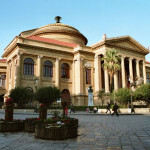 … it’s actually a very nice walk towards some of the most important and beautiful monuments in Palermo. 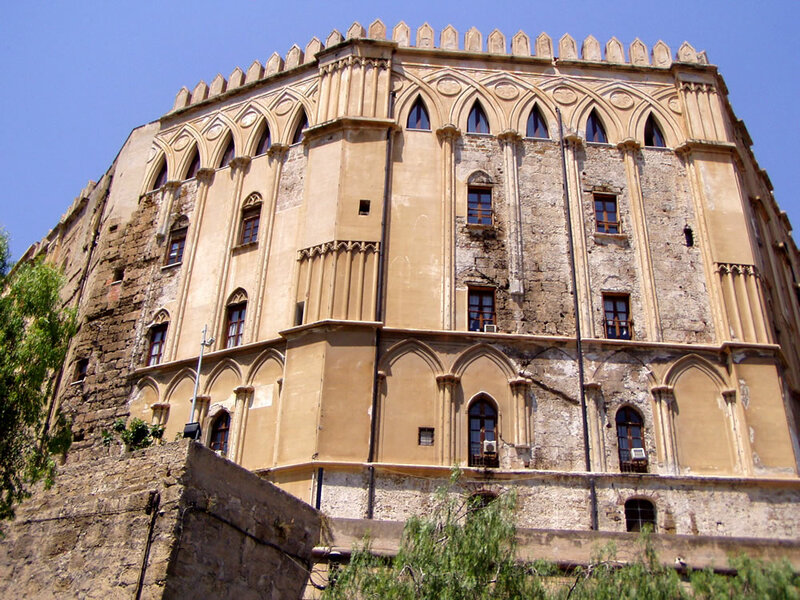 In fact, from our guesthouse it takes just 10 minutes to get to the most colossal and breathtaking monument in all of Palermo: “The Royal Palace or Norman Palace.” This palace was built up over the ruins of an Arabic fortress which was later changed to conform to medevial styles. 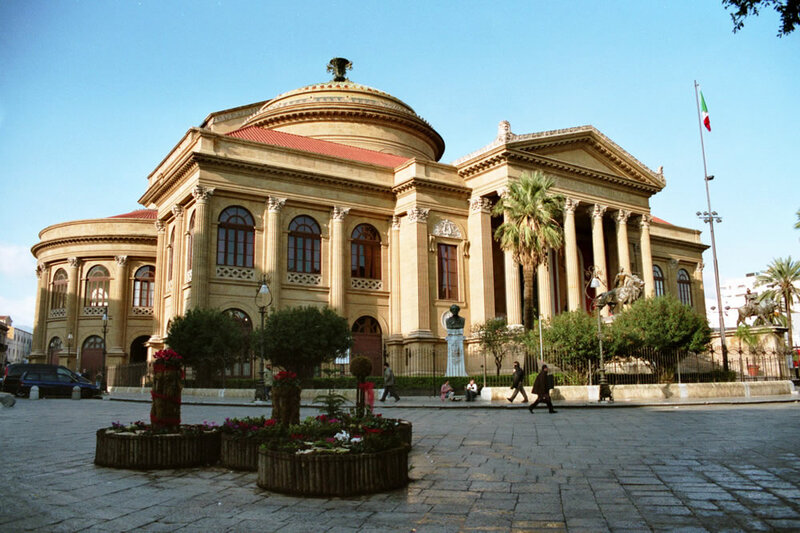 Throughout Palermo’s history, it has remained a constant reminder of the power interests inherent in Sicily and today it actually houses the Sicilian Regional Assembly. Once inside, you will marvel at the magnificent “Palatina Chapel” which, richly decorated with Byzantine mosaics, is still the most visited monument in Sicily. 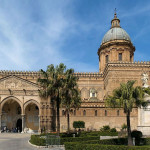 Five minutes walk from the Royal Palace, via “Porta Nuova” or “New Gate” (the ancient portal to the old city), you’ll get to the majestic Palermo Cathedral. 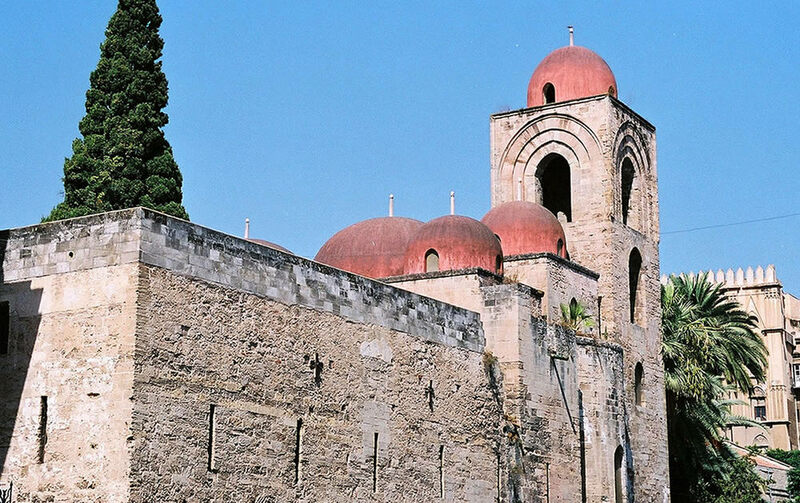 This Cathedral was erected in the medieval ages on top of the ruins of a little church and then later transformed into a mosque during the Arab period. Once inside you’ll find, among other things, the sarcophagus of emperor Federico II and once more, you’ll see why the juxtaposition of different architectural styles makes for a fascinating and unique construction. Now there’s just enough time for a quick snack, perhaps the typical “panelle e crocche” or cow spleen roll (pani ca’ meusa) at Nino u’ Ballerino’s,” situated right under our guesthouse, and then you should be ready to continue with the tour of Palermo’s monuments. Just two steps from here you’ll reach “Zisa Castle,” a medieval architectural construction with typical Arabic features, built to house the Royal family during the summertime. Its particular position, facing North-East, together with the thermal baths and the “Fountain Hall,” located within its walls, actually make the hot summer months more bearable…a kind of bed & breakfast in medieval key ! 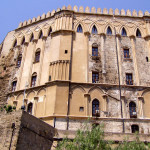 The “Cuba Castle” also has Norman-Arab features and this architectural style actually characterises a large part of the medieval constructions in the city. It’s situated in Corso Calatafimi (15 minutes on foot) and was erected in honour of King Guglielmo II at the end of the 12th century. It’s generally acknowledged that Palermo is the city of b&b and cchurches and that most of them are exceptionally beautiful. 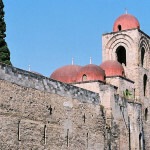 Although it would be impossible to describe them all, some definitely deserve to be named, like for example: “Casa Professa,” with its marble low relief decorating the apse’s podiums; the “Magione Church” with its linear and majestic Norman style; “Santa Maria della Catena” with its Gothic-Catalan style; the spectacular “Martorana Church” with its marvelous Byzantine mosaic decor which is directly adjacent to “San Cataldo Chapel”; “Santa Cita”; “San Domenico”; “San Giovanni dei Lebbrosi”; “San Giovanni degli Eremiti” and many others. While you’re wandering the small streets in the city centre, you’ll surely come across some magnificent churches in the most unlikely of places, discovering hidden treasures in unexplored alleyways. “Monreale Dome” needs a special mention and you can get there in around 20 minutes by catching bus number 389 from Piazza Indipendenza. I assure you that the time taken to get there is well worth it once you see its fascinating and superb interior. If you take Via Maqueda on your way back to our old Bed and Breakfast, today guesthouse, you’ll undoubtedly marvel at the image of one of the most beautiful theatres in the world: we’re taking about “Maximum Theatre” and I strongly recommend you go inside too. Around 15 minutes on foot from your room, the more courageous of you can visit the “Capuchin Monastary” made famous after the opening of its Catacombs and for its display of millions of corpses which have been mummified according to late 19th century tradition. Particularly noteworthy is the small body of Rosalia Lombardo who died in 1920 at just 2 years of age and whose body, displayed in a glass reliquary, appears to be perfectly intact. To this day experts still question the mystery surrounding this particular embalming technique.